Dylan Cruz Jaramillo obituary. Carnes Funeral Home. 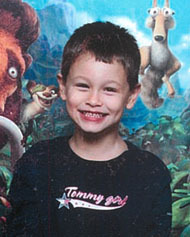 Dylan Cruz Jaramillo, age 8, passed away Monday, October 22, 2012 in La Marque, TX. He was born April 7, 2004 in Nassau Bay, TX. Dylan attended Westlawn Elementary School in La Marque, TX. He loved Legos, Wii, nerf guns, digging holes, scooters and bike riding, computer games and playing with his friends. He loved cartoons, especially Sponge Bob and he loved Bella (G’s dog). Dylan is survived by his parents, Henry Cruz Jaramillo, III and Lori Jaramillo; his sister Cassandra Jaramillo; grandparents “Papa” Henry Jaramillo and “Nanny” Kitten Jaramillo and “Pa” Ronald Huff and “G” Brenda Huff; uncles Jason and David Jaramillo and Lonnie Huff; cousins Dallas and Bailey Jaramillo and Austin Lee Huff. Visitation will be at Carnes Funeral Home, 3100 Gulf Freeway, Texas City, TX. on Friday, October 26, 2012 from 10 am until 12 pm with services to begin at 12 PM in the Chapel of the funeral home with Rev. Dennis Johns officiating. Dylan is sadly missed by all. Mommy and Daddy love you.